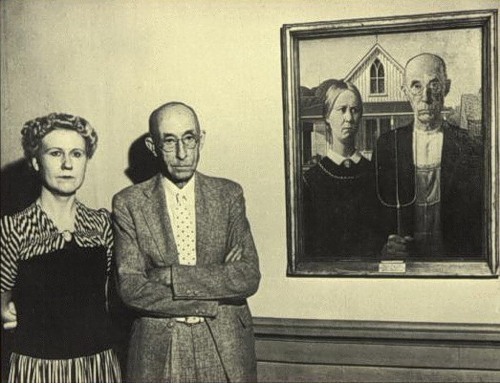 Grant Wood’s American Gothic and the couple that posed for the painting. Grant Wood’s American Gothic. The models are Grant Woods sister and dentist…. Wallpaper and background images in the Fine Art club tagged: fine art painting photo grant wood. This Fine Art photo might contain کاروبار سوٹ, بزنس سوٹ, اچھے کپڑے پہنے شخص, سوٹ, پتلون سوٹ, pantsuit, اچھی طرح کپڑے پہنے ہوئے شخص, and پنٹساٹ.